Archbishop Michael Desmond Hynes, acting as Facilitator, welcomed everyone to this, the 18th Annual Winter Workshop of the Cooley Environmental and Health Group. Sean Crudden explained that the Workshop was originally planned as a Millennium event, and had been repeated every year since. Dennis Pringle gave a brief presentation on the history of the mental health services in Ireland to provide some context for the following discussions. The full text of his presentation (plus some additional material that was omitted to save time) may be viewed here. Following this the main speaker was Lisa Butterly. Lisa gave a very clear presentation on Ardee Mental Hospital based on her much more extensive doctoral research. Her doctoral thesis may be viewed in full here. 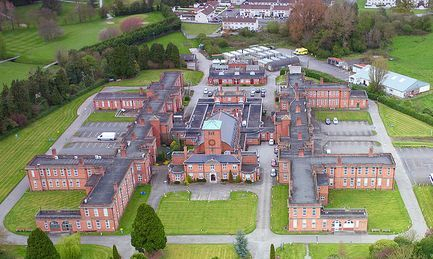 Lisa noted that the psychiatric hospital system established in the nineteenth century was organsised by Districts rather than by Counties and that Louth was a very small component in the much larger Richmond District centred on Dublin. Although contributing to the upkeep of the Richmond in Dublin, Louth residents had very little say in how it was run. After the Local Government Act in 1898, Louth public representatives began to campaign vigorously for a hospital closer to home in Louth. The campaign eventually proved successful and St. Brigid's hospital was opened in Ardee, with the aid of sweepstakes money in 1933. Lisa stressed how forward looking the Ardee facility was in contrast to the more custodial-orientated facilities built in the previously century. Jim Walsh of the Irish Advocacy Network was the third speaker. Jim gave a wide ranging talk on many aspects of the care and treatment mental patients. He is a strong advocate of a holistic approach in combating mental problems. People with mental issues need to be treated as people, and not just as patients. Jim raised many interesting questions for the audience to ponder over, but stressed that he did not necessarily have the answers. However, he felt that we needed a much more outward looking approach in which future issues might be identified in advance rather than simply responded to. Jim's notes for his presentation may be viewed here. The final speaker was Sean Crudden who read a short article he wrote a few years before after a visit to Enniscorthy. The full text of the article may be viewed here. Each group appointed a rapporteur to report back in the main body of the meeting for a more general discussion. A synopsis of some of the points raised by the sub-groups, which triggered a lively discussion, may be viewed here.The meeting finished around 5.30pm. More pictures taken at the 2018 Workshop may be viewed here.